Decorating gourds with painted patterns is an ancient art form from around the world. Many cultures in Africa, South America, Australia, New Guinea and the South Seas Islands make gourds into utilitarian objects, such as storage containers. They are often painted with patterns done in traditional styles. Gourd painting is a fine art among many African and American Indian tribes. Gourds provide an excellent wood or leather like surface for painting. They can be tole painted as folk art or decorated with traditional ethnic patterns handed down from generation to generation. 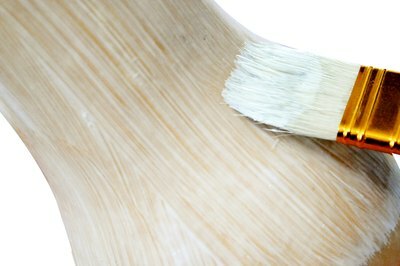 Select a smooth, fully dried hard-shell gourd or calabash for your painting surface. Pick a gourd with a nice shape and as few defects as possible. Use mini-bottle gourds for simple patterns or larger bushel gourds for more elaborate compositions. Let the shape and contours of the gourd inspire its pattern design. Prepare the gourd's surface before you begin painting. Clean the gourd with bleach diluted in a solution of water. 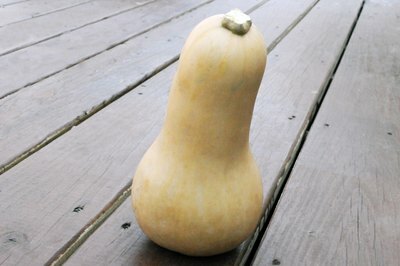 Use steel or copper wool to remove any remnants of the gourd's skin. Brush on a coat of gesso, then sand it smooth. Let it dry, then apply another, thinner layer, sanding it down with finer sandpaper or emery cloth. Work out your pattern design on paper before transfering it onto the gourd. Observe traditional African or Peruvian gourd art for ideas. Use stylized tole patterns inspired by Pennsylvania Dutch decorative traditions. Imitate the patterns of Zuni-, Hopi- and Acoma-painted clay pots for your painted gourd. Choose a gourd shaped like a pot when using tribal patterns. Borrow patterns from any culture or tradition you like or make up your own patterns entirely. 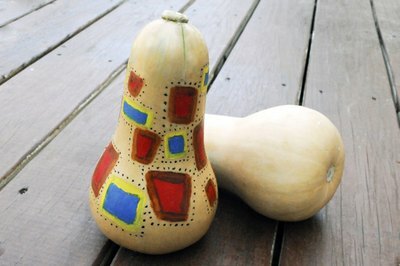 Draw the pattern onto the gourd's surface using a pencil or paint it on with a small pointed brush. For a three-dimensional or sculptural effect, carve the patterns into the gourd. Follow the contour of the gourd with the lines of the pattern. Another approach is to burn the design into the gourd using wood-burning tools with interchangeable tips. Peruvian gourd crafters use a long nail with the tip heated to etch patterns into the gourd. 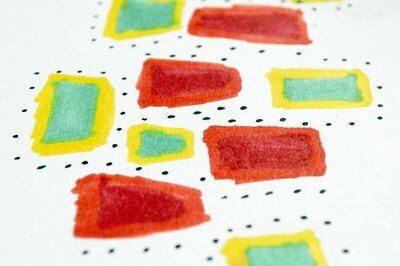 Use a combination of straight, wavy and zig-zag painted lines for your pattern. Paint between the lines of your drawn or carved pattern with oil or acrylic paints. Use bright colors or a monochromatic color scheme. Paint with a variety of brush strokes to add visual interest to your gourd. 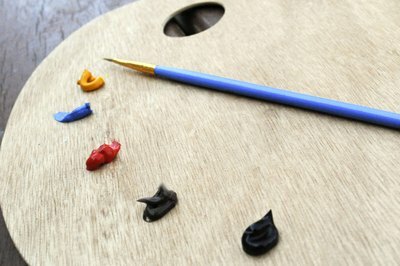 Build up layers of transparent color, or paint with a thick impasto technique. 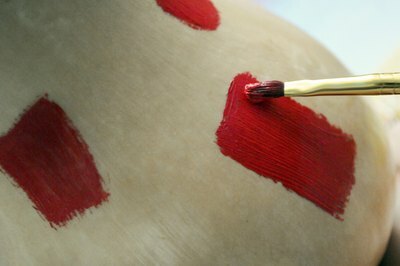 Let your brush strokes show, or smooth them out with a blending brush for uniform areas of color patterns. Skip the gesso and paint with wood stains to accentuate your patterns for a different look to your gourd.